Between multiprotocol label switching (MPLS) and software-defined networking (SDN), there were about 15 years where the networking world was pretty static. That has changed. Right now, we’re in a world moving as fast as the ISP world did back in the 90s, and every few weeks there’s something new. Check out the key findings below and download the report to get all of the details, including commentary on the findings from our Co-founder and CEO Avi Freedman, who has been in the networking industry for over three decades. Automation is trending: The largest majority of respondents (35%) marked automation as the most important network trend right now. Yet, only 15% of respondents said their organization is prepared for it. AI & ML buzzword fatigue: Despite the industry buzz around artificial intelligence (AI) and machine learning (ML), less than 1% of respondents marked it as a most important trend. However, 45.2% of respondents do perceive it to be helpful for network management. User experience network challenges: Data breach was “the biggest network worry” (33.1% of responses). However, user experience was right behind it (28.8% of responses). As more organizations conduct business online, network outages are now a direct tie to customer success for many companies across industries. Proliferation of tools for cloud visibility: There has been a huge proliferation of tools to manage cloud and internet dependencies. As a result, many organizations are trying various combinations of tools to manage the visibility challenge. Network traffic analytics appeared as the most commonly used way network professionals (28.3%) are managing the challenge. Shared tools challenge becomes more real: A majority of respondents (67%) agreed that using the same stack of tools to manage both network performance and security could significantly improve operational efficiencies. However, only about 40% of respondents (39.5%) said their organization is using the same stack of tools to manage both network performance and network security. Age-old problem with incident response still exists: The largest majority of respondents (30.1%) said the hardest part of managing and resolving an incident on their networks is that users or customers know about incidents before they do. Another 26% reported that their biggest challenge with incident response is that data exists, but they can’t access or analyze it easily. Without the ability to analyze network data in real time, network professionals cannot mitigate issues before they affect users and customers. With increased business reliance on internet connectivity, the network world has and will continue to get increasingly complex. We’re just in the early stages of how our industry will need to transform. But there’s good news: There’s progress being made. Many teams, including ours here at Kentik, are focused on rapidly solving these problems. To learn more about Kentik’s network analytics, request a demo or sign up for a free trial today. 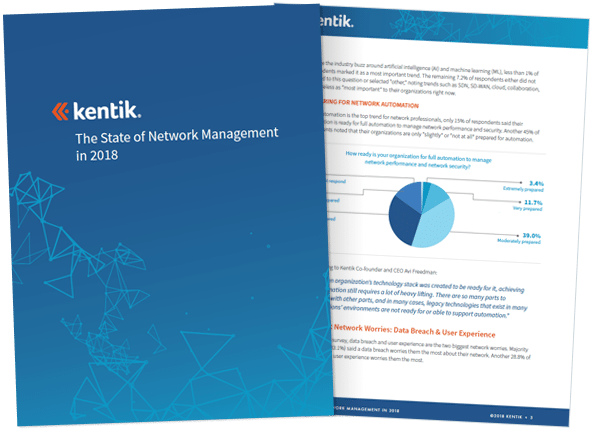 And don’t forget to download our 2018 State of Network Management Report.